Zoom in and focus on a topic you like! 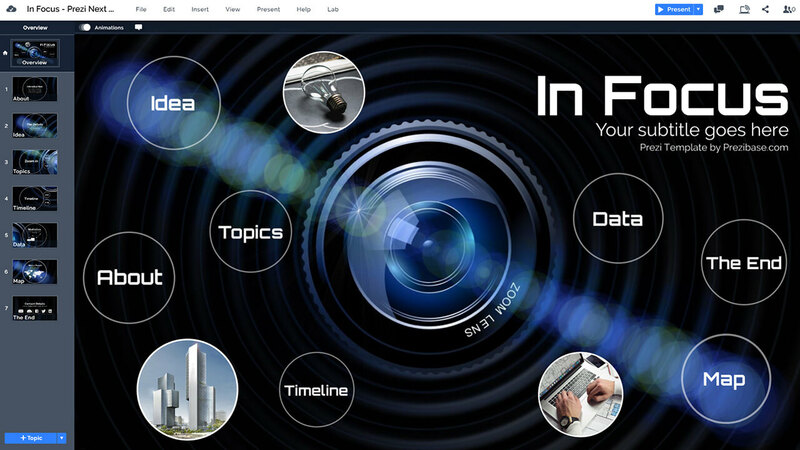 Prezi Next Presentation Template with a camera lens theme. Presentation template with the concept of focusing in-depth on a certain idea and investigating it. A camera lens with a light streak on a dark scene background. 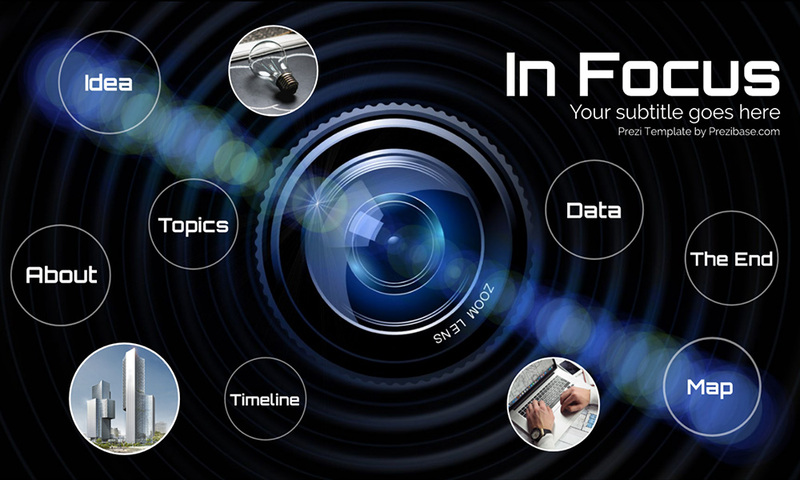 Zoom into the circles and customize the topics for your own presentation. Also suitable for the topics of multimedia, press, photography or image gallery! The presentation template starts with an overview of a camera zoom lens in the middle and topic circles scattered around it. There’s also a text placeholder for your presentation title in the top right. Use the template for topics related with photography or taking photos, for example journalism. The big zoom lens background is used with the concept of narrowly focusing on a specific topic or details. Lay your facts on the canvas and zoom in to reveal your slide content. You can easily customize the template by rearranging the elements, for example you can add more topic circles, resize them and add more images. Prezi does currently not allow to crop circular images, but for this you can use any free online tool such as Lunapic. So turn up the shutter speed so you’ll have clear shots of your slides! This entry was posted in Best Prezi presentation templates, Prezi Next Templates and tagged aperture, camera, camera lens presentation template, dark, gallery, image, image gallery presentation template, investigate, investigation, investigation presentation template, journalism, learn, lens, lens presentation template, media, photo, photography presentation, photography template, presentation template, press, prezi template photography, research, shutter, zoom lens.